Lately there's been a ton of talk about the importance of mobile-friendly websites. The "mobilegeddon" in which Google has added a new aspect of mobile-friendliness to its indexing algorithm threatens to bury non-mobile-friendly sites in search results. The reasoning for this is an obvious increase in the number of website visitors searching and accessing websites from their mobile devices. In fact, many sources agree that mobile use is likely to surpass desktop use in 2015. Search optimization aside, there are many reasons why a musician's website should be optimized for mobile and include functions that make it easier for your fans to find information. Here are just a few. Imagine one of your fans kicking off a road trip and wanting nothing more than to hear her absolute favorite song, or catching up with a friend and wanting to share your music. They pull up your website on their phone, push play... and nothing happens. Your website should include a responsive audio player designed to function across different sizes and types of devices. You're aware of how important it is to get your music out in the world, so make sure it actually plays. Some examples of responsive audio players you can check out include Cue for WordPress and Responsive HTML5 Audio Player Pro. Putting lyrics on your website is one of the easiest ways to increase traffic and allow your fans to make a stronger connection with your music. It may seem silly, but there's a reason people use song lyrics from their favorite songs to express themselves. Being able to read the words that you're hearing actually increases your ability to process and retain the information. I've even seen people pull up lyrics on their phones at shows and sing along. Give your audience the opportunity to do that without the dreaded pinch-and-zoom. Placing lyrics on your own website also ensures that they're 100 percent accurate as opposed to crowd-sourced sites where people are making their best guess. Another added bonus: song lyrics are the most searched for entertainment-related content across the web. Fans and venue owners want to be sure that you're actively playing, so it's important to list all of your shows. At a minimum, your site visitors should be able to get a list of upcoming shows including times and venue addresses. Don't assume that everyone knows where your favorite venue is located. Taking the extra step and giving mobile visitors a chance to get directions via a map and add the show to their calendars with just one click can only encourage them to come out and see you play. Mobile is also taking an increasingly larger percentage of e-commerce. Site visitors should easily be able to browse and search for items, and the checkout process should be short and painless. The more hoops someone has to jump through before completing their order, the more likely it is that they'll bail somewhere along the way. If your store is convoluted and difficult to navigate on a mobile device, you can be sure that you're losing merch sales. You can spend a ton of time trying to piece together your band's website by researching and utilizing many different tools. One option is embedding calendars and MP3 files from third party services and trying to force them to integrate nicely into your website. Or you can find an all-in-one solution that makes it easy to update your content and gives you the confidence that your website looks professional and works properly across all devices, operating systems, and browsers. 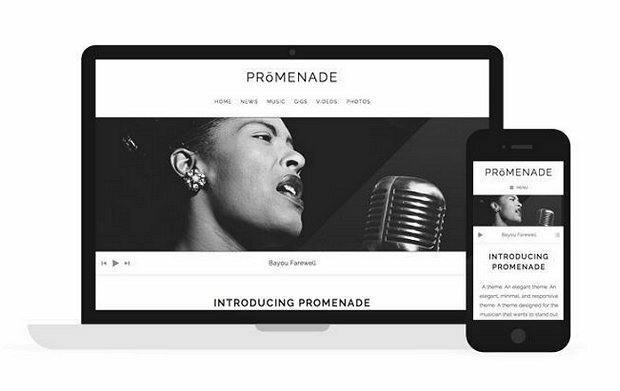 Use coupon code "Sonicbids" to get 20 percent off all AudioTheme premium WordPress themes. Anna DiTommaso is the marketing manager at AudioTheme and a singer/songwriter from Dallas, TX.